The personalised M&Ms small glass jar has to be one of the most delicious custom chocolate giveaways going around. 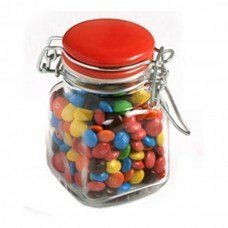 Give your clients something so memorable by gifting them with the promotional M&Ms Small Glass Jar. From the multi-coloured delicious contents to the high quality glass container, this product is an ideal corporate gift from the inside out. What a wonderful way to make your mark with potential customers by giving them M&Ms inside a cool looking container. The size of the branded M&Ms Small Glass Jar is 45mm in width and 80mm in height. Once ordered, you will receive 80 grams worth of mouth-watering M&Ms in each jar. The glass jar has a clip lock closure, which ensures that its contents always remain air tight. The lid of the glass jar can be customised in the following colours: black, white, blue and orange. The glass jar comes with full colour stickers which can be printed with your design of choice. These stickers can be placed on either the lid or on one of the four sides of the jar. The sticker on the lid is 25mm in diameter, while the sticker on the side is 33mm in width and 33mm in height. Give it your company logo, contact details, and other important information you’d like to share. What’s also cool about the this edible promotional product is that you can keep on using the jar right after all the delicious M&Ms have been consumed, giving you an extended advertising. For an equally colourful candy that has a tangy taste, you might want to consider ordering the customised Chewy Fruits Small Apothecary Jar. 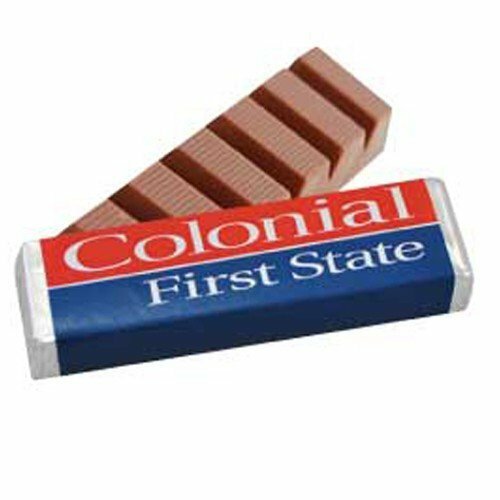 It comes in a decorative jar that’s ideal for showing off your company branding. Once the holidays roll around, you can also order the personalised Christmas Chocolates 30 gram Cube. It’s a great way to celebrate this joyous holiday while promoting your brand. Advertising has never been as fun or colourful before, with our custom M&Ms Small Glass Jar. Our confectioneries are excellent additions to your events and parties! For sports and competitive events, check out the Six Panel Promo Cotton Twill Mesh Back Cap and other promotional caps! To learn more about creating your own promotional confectionery gifts, call us at 1300 008 300, or use our live chat feature on the website to get in touch with our customer service team.